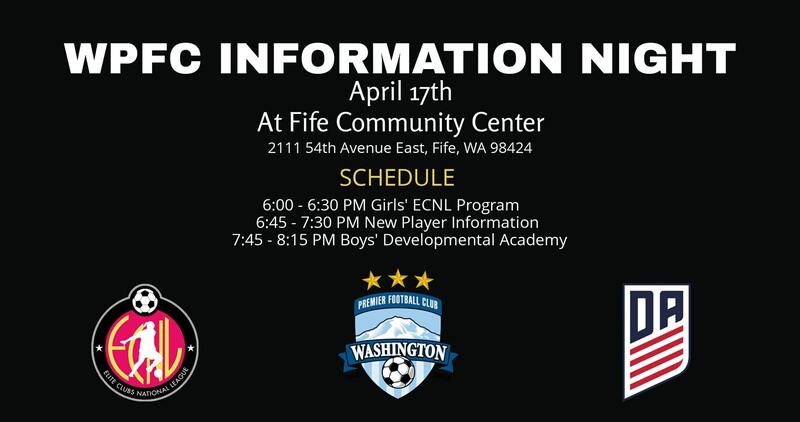 Washington Premier Football club will be hosting an Information Session on Tuesday, April 16, 2019. This is a great opportunity for parents who want their child to tryout for Washington Premier FC and existing parents to learn more about the programs and playing opportunities the club has to offer. Director of Coaching, Seth Spidahl and other staff members will be leading the session and will be available to answer your questions. Where: The gym at Relife School located at 5515 44th Street East, Puyallup, WA. 98371 (Next to Washington Premier’s complex). Entrance to the gym is on the backside of the school, easiest access to the back of the school is to go through the pedestrian gate between the school and soccer complex.